We've had a bunch of folks trash their own Internet connection recently using DropBox. 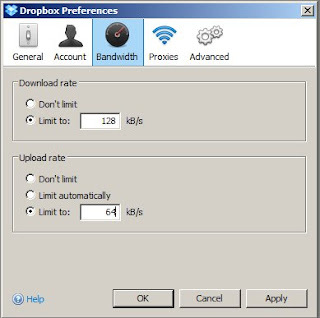 DropBox will use ALL of the available bandwidth at your site. This can cause trouble with web browsing, Netflix, e-mail, etc. It can also cause trouble for your neighbors by using all of the available bandwidth in your area. If you are pushing or pulling a pile of data, please take a min to manage your bandwidth. Remember, the settings are in kiloBYTES per second, not kilobits. It matters. The Internet connection you save might be your own.